Have you been through hell lately? Would you love it if God just kissed your life with a whole lot of mercy, favor, lovingkindness, and compassion right now? Are you ready for Him to turn everything around for your good? So am I. And that’s good, because if we’ve got the faith to believe for it and are willing to pray it in, that’s exactly what God wants to do. I learned about the lovingkindness of God awhile back, when I was studying Isaiah 55. Isaiah 55 is a word to the weary. It’s water for the dry, worn-out, tired, frazzled soul. Behold, I made him a witness to the peoples, a leader and commander for the peoples” (Isaiah 55:1-4 ESV). Incline your ear, and come to Me. Hear, and your soul shall live; and I will make an everlasting covenant with you—the sure mercies of David. Indeed I have given him as a witness to the people, a leader and commander for the people” (Isaiah 55:3-4 NKJV). Why does this matter to you and me when we’re burned out, worn out, battled-out, and tired? I wondered about that too. When I first started studying deeply into what became my 21 Kisses series, I saw the phrase “the sure mercies of David” (in Isaiah 55:3 NKJV), and I noticed that God said here that He gave David to be a witness, leader, and commander to us. So I wondered: What is it about David that makes him a witness to me? Even though I have studied David for many years, I couldn’t recall to mind anything that told me David was a witness into my own life other than the obvious: the slaying of giants, the from-shepherd-to-king story that shows all of us that God sees the little guy. However, I knew there had to be more than that if God is saying He gave David to be a witness and commander to us. “Witness,” “leader,” and “commander” are all pretty big jobs. What are these “sure mercies of David” that God is promising to give us? Because whatever they are, I sure want them. I’ve been through hell lately (and I know many of you have too). I want everything good God has for me, and I want it in double and triple portion. I want it in spades. I want punitive damages back (watch for a blog post on praying for punitive damages soon) as restitution for everything the enemy has stolen from me. Of course I’m seeking God for His face and for the beauty of His Person. But I want His blessings too! Truly, beloved, think about it: aren’t you ready to see the manifestation of all God’s promises? No matter what you’re going through, I believe that your nightmare has ended, in the spirit realm. As I wrote in this prophetic word, God has already put the kibosh on it. It may take time for details to work themselves out and for things to settle down; but in the spirit realm, it’s over. Victory is assured. And now, across the Body of Christ, the healing process has begun. But anyhow, if God is making a covenant with us and giving us the sure mercies of David, what are those mercies? “Chesed” is covenant love. It is the tangible demonstration of God’s covenant love to you. It is the kiss of God on your life. And God has promised to have mercy on you throughout the Bible. His manifest kindness, covenant love, favor, grace, and mercy are available to YOU. Surely goodness and mercy shall follow me all the days of my life; and I will dwell in the house of the Lord forever” (Psalm 23:6). “All the paths of the Lord are mercy and truth, to such as keep His covenant and His testimonies” (Psalm 25:10). “I will be glad and rejoice in Your mercy, for You have considered my trouble; You have known my soul in adversities, and have not shut me up into the hand of the enemy; You have set my feet in a wide place” (Psalm 31:7-8). “Make Your face shine upon Your servant; save me for Your mercies’ sake” (Psalm 31:16). “Many sorrows shall be to the wicked; but he who trusts in the Lord, mercy shall surround him” (Psalm 32:10). Is it any wonder that David cried out to be saved from his enemies by virtue of God’s mercy? Make Your face shine upon Your servant; save me for Your mercies’ sake” (Psalm 31:16, emphasis mine). Do you need mercy today, beloved? If so, you can cry out to God the same way. 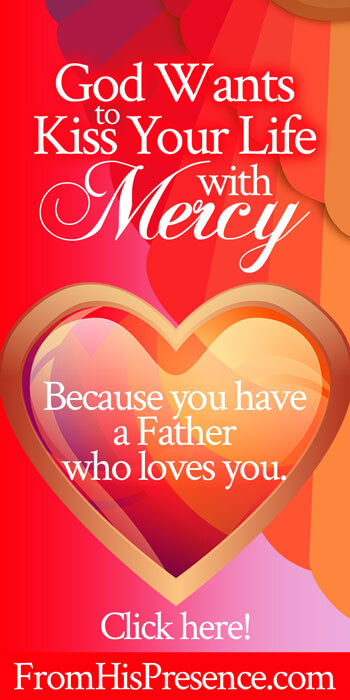 His mercy is available to you right now. If you are in Christ, then you have access to everything God is and everything He has. EVERYTHING. His divine power has given us all things that are suited to life and godliness (2 Peter 1:3). So what kind of help do you need from God today? Do you need comfort from a horrible wound someone has inflicted on you? Do you need physical healing? Do you need financial provision–perhaps a new job or an increase in pay? Do you need a roof over your head? Do you need to know that God loves you, and that you are not forsaken, not abandoned, not desolate, not passed over by the One who matters? Whatever you need from God, you can ask Him for it, claiming His mercy and His covenant with you through Christ. Therefore know that the Lord your God, He is God, the faithful God who keeps covenant and mercy for a thousand generations with those who love Him and keep His commandments …” (emphasis mine). He keeps MERCY to a thousand generations–and, sure enough, that word “mercy” is chesed. So if you need mercy, you can ask for it today. How do you ask? Just like David did in Psalm 31:16: “Oh God, make Your face shine upon Your servant; save me for Your mercies’ sake.” Just pray that prayer in faith, drawing upon God’s covenant to give you mercy because you are in Christ Jesus. Be sure you pray in faith; James 1:6 says that the person who doubts will not receive anything from the Lord. But if you pray in faith, Papa will answer. And if you need faith for mercy, beloved, please: PLEASE listen to my 21 Kisses: The Sure Mercies of David for Your Life teaching set. This word is a prophetic word that will fill you with hope, joy, comfort, and expectation for good as if you were breathing in great gasps of air. 21 Kisses by itself is over 3.5 hours of on-time, rhema, prophetic teaching about how God will pour out His mercy on your life. His mercy doesn’t always look like you expect it to look. Sometimes it arrives in very strange ways. His ways are perfect, and only He can give you the mercy you need. So please, if you need mercy in your life, download your copy of 21 Kisses: The Sure Mercies of David for Your Life TODAY. You’ll be so glad you did. I’ve made three product bundles for you. First, there’s the basic 21 Kisses MP3 set. The Superpack is a $49 value, marked down to $35 this week only. Then, only for those who already have the Finding Deep Soul Healing 101 webinar, there is a middle bundle that includes everything the Superpack includes, except the webinar. The Superpack-minus-webinar bundle is a $34 value, marked down to $24 this week only. These launch prices are the cheapest prices these sets will ever be. They will be available only this week, through Saturday, January 21, 2017. No coupon code is required. Please run, don’t walk, to get your copy. And after next Saturday, the prices will increase to the regular prices of $25, $34, and $49 for the three different bundle options. So … don’t wait to get these materials which will encourage you and help you! Beloved, we depend on God’s mercy. It’s all about His love, His mercy, and His grace, which were made available to us through the blood of Jesus, who was slain from the foundation of the world. Will you call on Him today? Will you study and build your faith to receive? If so, He will answer. He is near to all who call upon Him in truth, and He will show mercy to you. Kathy, I just felt led to encourage you today and tell you that Father God sees your every need, even the ones you don’t know about yet. He loves you so very much, and He will always honor His covenant with you in Christ. Appeal to Him for His help by virtue of His covenant and mercy. He will answer. I woke up this morning, thanking God for another day he has allowed me to see and I went to check my emails and seen that you Sister Jamie had posted another post, I love all of your post, this particular post you posted today was so for me and it is something that I needed to hear and read. (Mercy). I am going through an unjust situation in my life right now to were I know I had some wrong doings in it but a lot of lies are being told as well on me. I have been so scared and stressed and sad and then I get some joy and then the enemie comes in and brings another blow again. I have called on God and asked him to forgive me for all of my sins and to have mercy on me. I trust in God, I just have a problem with giving all my burdens to the Lord and forgiving myself for my wrong doings. In your post about Mercy, it has given me hope this morning to hold on to God’s unchanging hand and to believe what it says in his word about having a little faith little as a mustard seed. Just like God has done it for David and many more. I just want to first off give praise and honor to God for giving you the spirit of anointing and discernment to reach out to the whole world with great messages from God at no cost, no price, just you being obedient to our heavenly Father. I love you Sister Jamie, and thank you again for your blessing in love with messages that can see me and many others through in times of Triumphs. Sister Selena, thank you so much for sharing this. I’m so glad Papa has blessed you through my blog, and I pray He would send you more help from Zion than you could ever have imagined He would. I urge you to plead the blood of Jesus in your prayers. Remind Father that the blood of Jesus bought mercy for you, and appeal to Him for His divine intervention by virtue of that covenant. He will always honor that. I thank you for this email this morning this is what I needed to hear. I thank God for his mercy and grace he gives us everyday. May you have a bless day. Thank you so much for reading, Millie! I pray Father would bless you today and help you see all the ways He is pouring out mercy on you, and bringing transformation to your situation, in Jesus’ name! I am glad that the kibosh has been put on it. Forever! I do believe that the fast moved things and prayers are being answered. Thank you for an encouraging word. It is much appreciated. Amen! Jesus wins every time! Thank you for reading, as always, Rebecca! Hi Jaime, I just want you to know that I look forward to receiving your emails I just love how Papa uses you. When I started reading this email I cried because I really needed to hear that Papa understands I just love Him so much He’s a good good Father . Thank you for being a blessing to us women of God. Amen. 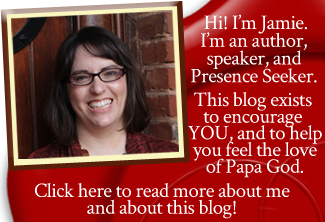 Sandra, thank you so much for sharing how Papa blessed you. This so encouraged me. All the glory belongs to Jesus! You’re absolutely right … He’s such a good Daddy. Many blessings to you today.